Figure 1. Properly staked tree adds support. 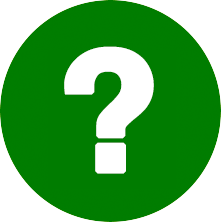 “No,” is the likely answer to these common questions about post-planting tree care. Trees establish themselves quite well in normal situations. Support systems such as staking and guying are, in most cases, unnecessary and can even be detrimental. Movement caused by the wind is crucial to help saplings develop into strong, structurally balanced trees. 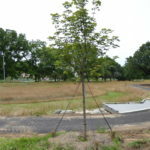 However, in unusual conditions, staking, guying, or a similar system may be needed to hold trees upright until adequate root growth anchors them firmly in the soil. When necessary, the support system must be installed properly and removed at the appropriate time to prevent damage. 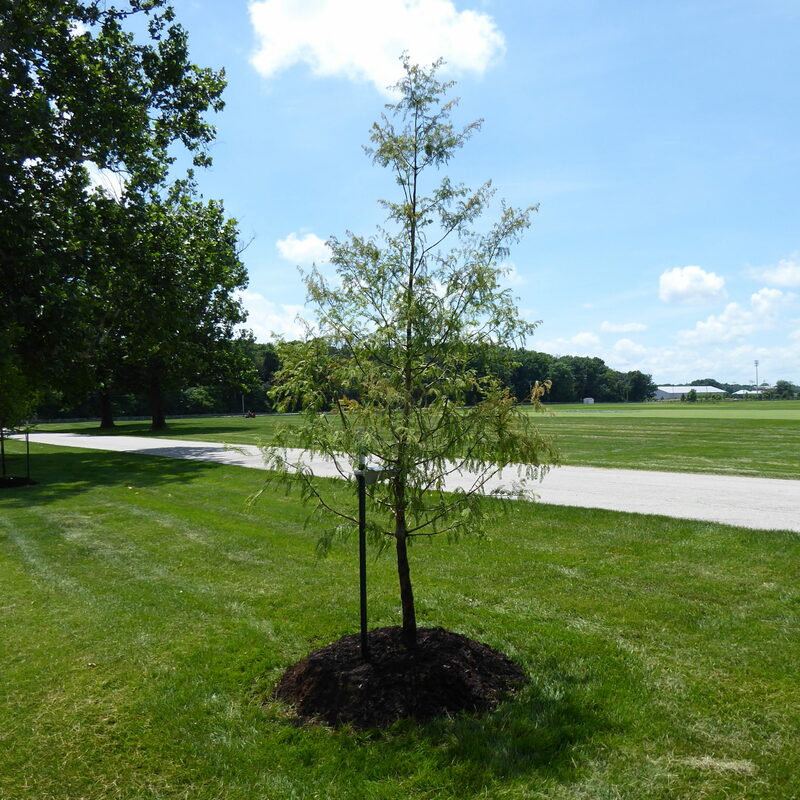 When stakes are needed, timing depends on the environment and the type of tree. 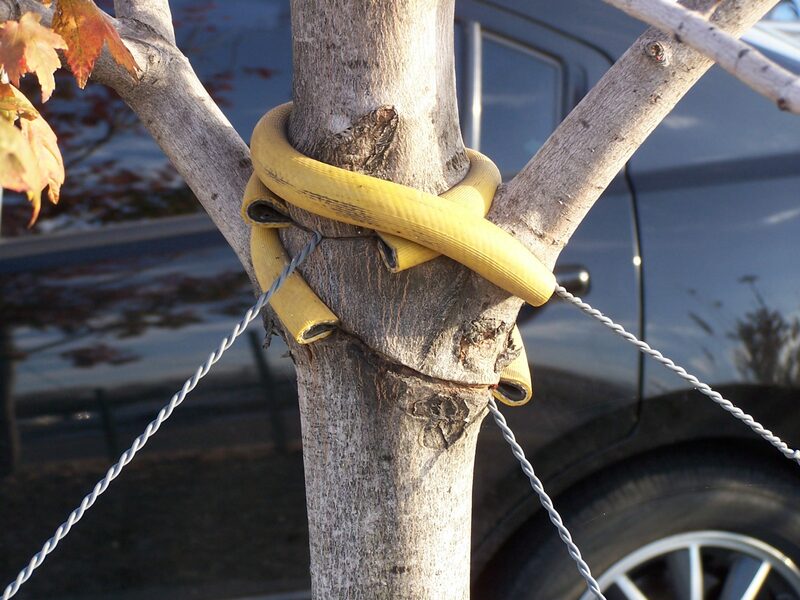 Improperly staked trees suffer from poor development such as decreased trunk diameters and smaller root systems—and may be unable to stay upright after you take the supports away. Often trunk tissue suffers from rubbing and may even be girdled by support materials. Also, due to poor development and taper, previously supported trunks are more likely to break off in high winds or blow over after stakes are removed. Figure 2. Guy wires can provide stability in harsh, windy conditions. 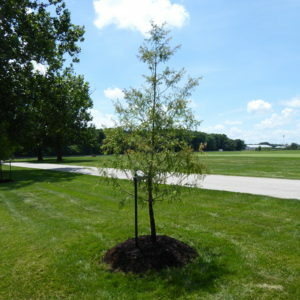 Staking and guying a tree trunk to keep it upright can be a necessary, temporary support system, but does not compensate for poor root development and establishment long-term. Guying is temporary and typically used on larger trees that are transplanted balled-and-burlapped. Three points of attachment provide the best support for these large-trees. Staking connects the trunk to a nearby steel or wooden post. This is a common approach on smaller trees or containerized tree stock. Underground stabilizing systems are also effective and economical for stabilizing the root balls on larger balled-and-burlapped trees. There are several commercial anchor systems available. Figure 3. Support materials left too long can damage trees. The cardinal sins of support include: staking trees too high, too tightly, and for too long which all cause tree damage. Improper staking can cause stem abrasions and trunk girdling. Review the anchor, attachment point, and tension on a regular basis, adjusting as needed to make certain the supports are effective and not damaging the tree. 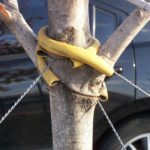 If a tree is supported, the ties and guys should be removed as soon as feasible, usually no later than after one growing season or one year. 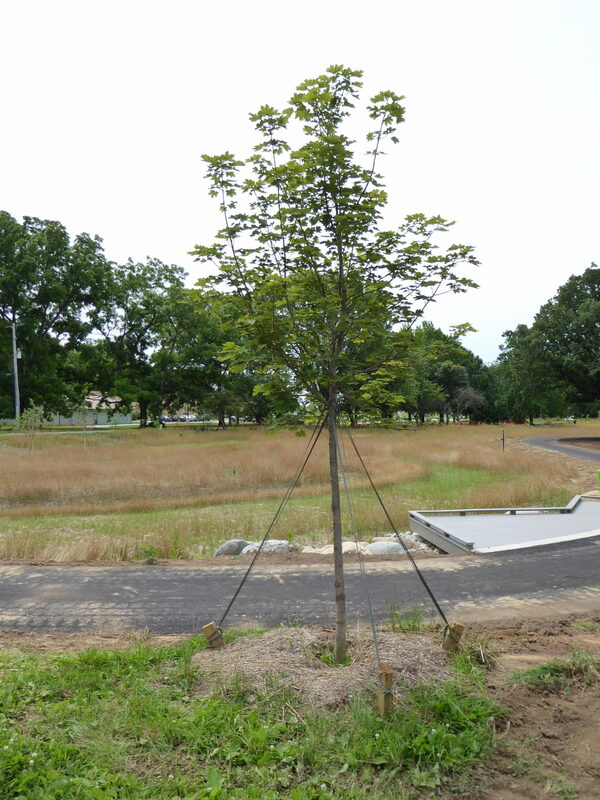 For more information see Purdue extension publication, FNR-547-W Tree Support Systems https://www.extension.purdue.edu/extmedia/FNR/FNR-547-W.pdf.